Unfortunately, the technical breakthrough at Bell could not overcome economics. 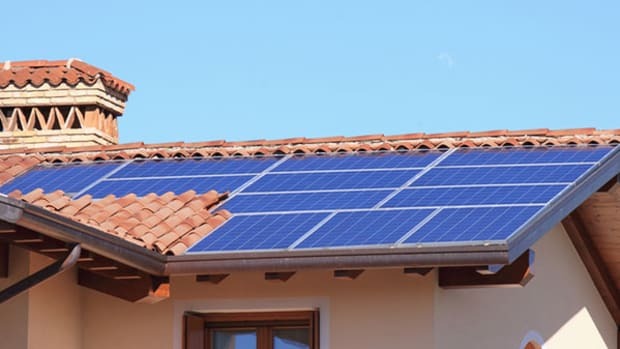 With a one-watt cell costing $286 at the time ($2,244 in 2008 dollars), a homeowner would have had to pay more than $1 million for an array of sufficient size to power the house. At that moment, solar cells could not compete with coal, oil or gas for producing utility-scale electricity. In the first years, they seemed relegated to powering such novelty items as toys and the new transistor radios when at the beach. Serendipitously, the Air Force and the Army were engaged in a program where they immediately saw the need for the new Bell invention: a power source for operations in space where no electrical lines could reach — not to mention charge a battery or fuel a generator. Both branches of the military were making top-secret plans to launch a satellite. Operations above Earth’s atmosphere, they believed, would be ideal for the solar device, freed from the tyranny of night and clouds. Although the Russians beat the Americans to the punch in launching the first two Sputniks in 1957, they demonstrated the need for the long-lived power solar could provide: The Sputniks’ batteries died after several weeks in orbit, and the millions of rubles’ worth of electronics they powered became worthless junk. The next year’s successful launch of America’s Vanguard, the world’s first satellite relying on solar cells, proved the value of the new sun-powered invention. Weeks went by, months and years passed and the Vanguard kept on transmitting. Solar cells became critically important to space programs worldwide. Their longevity ushered in a new era where satellites have become indispensable for modern life, whether for military purposes, such as reconnaissance, secure communications or the guidance of smart weapons; for commercial ventures, from keeping tabs on scattered assets throughout the globe to air and sea navigation to enabling ATM or credit card transactions; for science, to gain a better view of our universe or Earth; and for entertainment, from DirecTV to seamless newscasting across the globe. The unexpected and relatively large demand for solar cells for space proved crucial for their commercialization. Their success above Earth gave those below a vision of how solar cells could benefit people living in remote terrestrial locations where power lines did not reach yet the need existed for electricity. The first commercial use of photovoltaics on Earth powered navigation horns and lights on oil rigs in the Gulf of Mexico. Their previous source of power — huge primary batteries — proved costly both to install and to dispose of. The oil industry also came to rely on photovoltaics to deliver small amounts of electricity into the ground to prevent oil and gas lines and well casings from corroding. It cost the U.S. Coast Guard more to place primary batteries in buoys than to pay for the buoys themselves. Solar cells connected to much-smaller secondary batteries that could do the job while saving taxpayers millions of dollars. Today, 99 percent of the world’s buoys and lighthouses rely on the sun to keep navigation safe. Once telephone lines gave way to microwave repeaters and satellites for station-to-station communications, poles and lines along railroad tracks became unnecessary and costly to maintain. Economics demanded their demise. Track safety still required signaling and shunting equipment that needed small amounts of power. Extending utility lines to run a few watts here and there would have proven cost-prohibitive. Panels strategically located have done a more cost-effective job. By the 1970s, most in the developed world had long-distance telephone service. Residents in isolated communities in the American West and in isolated areas of Australia did not. Microwave repeaters powered by generators or batteries could have brought such service right to their doorsteps. But because they had to cross great lengths, many times through rugged terrain, the transportation of fuel or batteries to such sites called for building roads or helicoptering in supplies. Either choice was outrageously costly. Utilizing the new transistorized electronics that needed only a few watts allowed the power source to be solar cells. Their reliability and self-fueling required a visit no more than twice a year. By the mid-1980s, photovoltaics had become the energy source of choice for remote telecommunication networks worldwide. Unlike the developed world, billions across the globe have no electricity. Those without have had to rely on costly, dangerous and heavily polluting ad hoc solutions for lighting and electricity, such as candles, kerosene lamps, batteries and generators. Bringing in the electricity by installing modules has proven a better solution. Since 1983, half of the households on the outlying islands of Tahiti have chosen photovoltaics. More rural Kenyans use electricity from solar cells than from the national utility. Several million in the developing world power their lights, television sets and radios with electricity from the sun. The numbers keep increasing. Waterborne diseases debilitate and kill great numbers in these regions as well. Photovoltaics has proven a godsend in such situations because the technology can kill the pathogens by powering either ultraviolet water purification systems or pumps that draw water from deep aquifers free of any sources of pollution.